We strive to empower and support people who have fallen into crisis, for whatever reason, to rebuild their lives and create a better, healthier, happier future. 'Rebuilding Lives' is the pioneering and holistic working model created by The Matthew Tree Project (TMTP) which provides a complete 'wrap-around' range of support and guidance services for those living on the very edge of society, hit by crisis and at risk of homelessness. 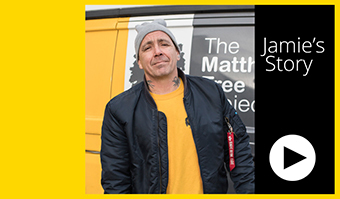 The Matthew Tree Project holistic ethos is to meet people at their point of crisis. To love. To understand. To empower. To support. In the centre of our ‘tree’ logo is the word ‘love’, written in Chinese, to depict branches of compassion reaching out to people in their time of need. The simple and compassionate act of giving people food on a weekly basis has created a safe and positive environment to build relationship and gain an understanding of each person’s circumstances. This allows us to engage on a much deeper level - to get to the heart of the problem, and then support people to move from crisis to independence in the best possible way. The Matthew Tree Project is a faith inspired charity with an ethos underpinned by Matthew 25 vs 31-46; Mark 12 vs 28- 31; and James 2 vs 14-17.